Living in a world surrounded by trials of life is not simple but there is something that powers each one of us, it is something that moves me and you to believe for better days, it is a habit which has been embodied to everyone with or without our will. 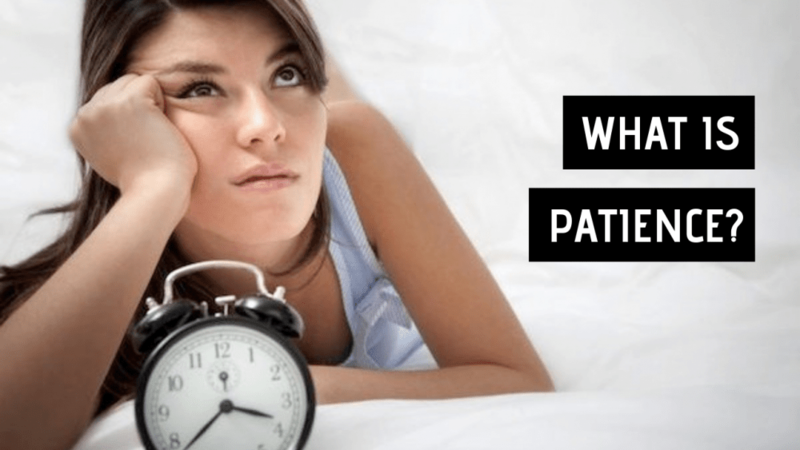 So, what is patience? Patience is facing a fragile way of living calmly, it is a silent war which never ends between a real personality hidden somewhere deep in everyone. A patient person has some of the listed traits as below. Let’s find out what is patience? Education is a key role when it comes to patience too. People who are well educated express their patience in the best manner that is because they know how to manage it and how to show to others who are not patient in any case. Those people are considered as mirrors which reflect how education has shaped their way to manage it in good or bad situations. In this case, education can be used as a weapon which might protect people who know how to work with it. Have you ever met someone who lives without worries and needs? Is anybody who has not experienced a battle between his/her personality? Most of us know the mission of this life to which we are not created to live without worries and problems, in that case, it could not make sense to live. Everyone in this world has his/her own problems but some differ from each other, some of them are not as they appear to be the others are apparently true. In those situations, there are individuals who manage whether to escape or facing them, there are those who fight them quietly, they are those who became masters to do strategies and techniques to the solution. Furthermore, those strategies that they choose do not hurt anyone, do not have any cost, and most valuable are unique strategies which might be found to those who have a strong personality to fight with themselves without hurting anyone. This depends on a person to another how he/she is able to handle them. Thus, the purpose of patience is how to figure out solutions rather than excuses. Patience can be shown through the tolerance in hard times and situations, there are those who have the capacity to slow down themselves while facing issues of life, there are persons who are able to risk themselves in helping others. Those personalities can be revealed through their face and body if there could be a description so that they can be compared to angles to be created to share good deeds to the individuals even if their souls are in troubles but that reflect positivity to the people around. Moreover, patience through tolerance is a great strategy which divulges leadership skills toward life’s troubles no matter how difficult it could be, it shapes a character to solve problems. No matter how difficult is living under pressure trying to reach sunny days, there are aims of the life which move someone and make stronger to trust the future of better days, there are those dreams to be true. Nevertheless, those dreams might take time, effort and might challenge you and your temperament but in the end, it is a visible reality of the patience. Additionally, this is the power of a patient person who has no comparison, someone might name it lifelong test the others might consider it as a merited punishment, whatever you may call it is a bridge to which every human must walk. This bridge has its own rules to walk, in the case of not respecting them the probability to fall down can be possible, it is a balance of what a person is and how it might change in some situations. It true that patient people pay attention to those whom they interact even if the discussion is not related to their interest, they are able to listen to their interlocutor. Giving an opportunity to listen is not easy because those persons might provoke patience and emotions. There might be cases of expressing emotions which might put a person in a difficult situation but it needs an answer. This is a good habit which helps those who have problems but nobody is able to give at least an advice and only those who are patient can do this. They are prepared to be a good listener because their way of communicating with them give people the freedom to express their rancor. When it comes to a good listening there is another trait which might be found to them such as loyalty through their communication. Since they give this chance to share their concerns in front of a patient person that is naturally to trust. In other words, being patient means having a big heart which supports with or without talking, shares positive ideas, gives time, and most important tries to reflect his/her traits of being patient. Hence, the meaning of patience can be proven in many characters, it is just how you chose to resolve it, it tells how to respond to others in their bad days, it is a period which shapes a personality and prepare for better and worse days. Finally, in whatever names you define them it tells your manners of personality to be a better person in difficult times. Previous articleHow Introverts Stand Out From the Rest of the League? Maslow’s Hierarchy of Needs | What is Maslow’s Theory? What Drives People To Become Spiritual?